Summary: fNIRS technology is allowing ALS patients who are ‘locked in’ to communicate, a new study reports. Source: SUNY Downstate Medical Center. Functional near infrared spectroscopic (fNIRS) imaging (pronounced f-nears) has led to a breakthrough in communication with ALS patients who are “Locked-In,” meaning they are in advanced stages of the disease where the brain is conscious and functioning, but they are unable to move any muscles, including the eyes. Using a wearable system developed by SUNY Downstate Medical Center researcher Dr. Randall Barbour, a team of investigators led by Professor Niels Birbaumer at the Wyss Center for Bio and Neuroengineering in Switzerland and University of Tübingen in Germany were able to measure the brain’s hemodynamic response to a series of ‘yes’ or ‘no’ questions, thus allowing these patients to communicate. The results of the trial were published recently in PLOS Biology. 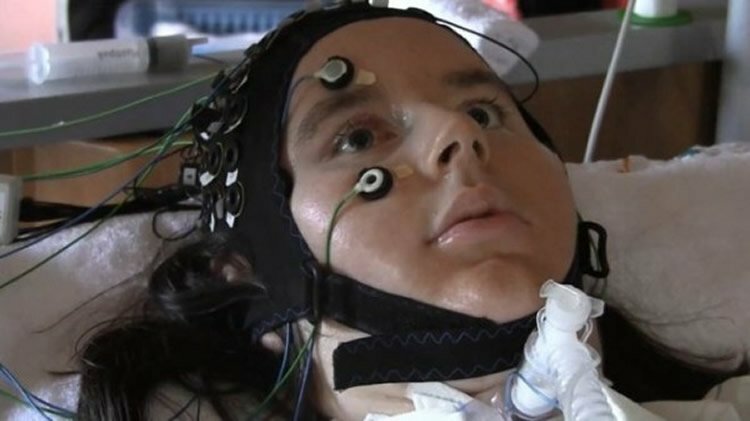 ALS patient takes part in fNIRS trial NeuroscienceNews.com image is credited to Wyss Center, via BBC. Non-invasive and wearable, the fNIRS system may eventually be incorporated into a home environment, allowing family, friends, and caregivers to communicate with the patient for the first time since the onset of this severe stage ALS. The technology was developed by Dr. Barbour and licensed to NIRx Medical Technologies, through the SUNY Downstate technology transfer program. Together with Professor Birbaumer, NIRx and other partners have been awarded a 3-year grant to further advance fNIRS sensing capabilities working toward the development of a version for in-home use.ay have expertise in metacognitive therapy,” says Hagen. Funding: This work was supported in part by DARPA project N66001-10-C-2008, New York State Department of Health, and the National Institutes of Health/National Institute of Neurological Disorders and Stroke under Grant R42NS050007, R44NS049734, and R21NS067278. Image Source: NeuroscienceNews.com image is credited to Wyss Center, via BBC. Video Source: Video credited to NIRx Medical Technologies. SUNY Downstate Medical Center “Locked-In ALS Patients Answer Yes or No Questions with Wearable fNIRS Device.” NeuroscienceNews. NeuroscienceNews, 13 March 2017. SUNY Downstate Medical Center “Locked-In ALS Patients Answer Yes or No Questions with Wearable fNIRS Device.” http://neurosciencenews.com/locked-in-als-fnirs-6238/ (accessed March 13, 2017). Despite partial success, communication has remained impossible for persons suffering from complete motor paralysis but intact cognitive and emotional processing, a state called complete locked-in state (CLIS). Based on a motor learning theoretical context and on the failure of neuroelectric brain–computer interface (BCI) communication attempts in CLIS, we here report BCI communication using functional near-infrared spectroscopy (fNIRS) and an implicit attentional processing procedure. Four patients suffering from advanced amyotrophic lateral sclerosis (ALS)—two of them in permanent CLIS and two entering the CLIS without reliable means of communication—learned to answer personal questions with known answers and open questions all requiring a “yes” or “no” thought using frontocentral oxygenation changes measured with fNIRS. Three patients completed more than 46 sessions spread over several weeks, and one patient (patient W) completed 20 sessions. Online fNIRS classification of personal questions with known answers and open questions using linear support vector machine (SVM) resulted in an above-chance-level correct response rate over 70%. Electroencephalographic oscillations and electrooculographic signals did not exceed the chance-level threshold for correct communication despite occasional differences between the physiological signals representing a “yes” or “no” response. However, electroencephalogram (EEG) changes in the theta-frequency band correlated with inferior communication performance, probably because of decreased vigilance and attention. If replicated with ALS patients in CLIS, these positive results could indicate the first step towards abolition of complete locked-in states, at least for ALS.